In 2009 SDWG received an invitation from PLACCC, a festival for site-specific art to create an intervention in downtown Budapest. Our choice fell upon Blaha Lujza Square, a scene of architectural, social and environmental decay. Originally, the square, was a conventional but well-structured space with the National Theatre and a state of the art mall being its main attractions. Over the years its small green area was turned into a parking lot, followed by the demolition of the theatre in the sixties, when a metro tunnel was driven underneath it (something citizens interpreted as a political move). Serving only through-traffic with no internal functions left, the square turned into a polluted junction, an ill-famed place by the nineties, riddled with crime and homelessness. Futile steps taken to reanimate the square included the replacement of the benches with single iron chairs in order to prevent the homeless from sleeping there, making their lives more difficult without making the place more usable for passers-by. SDWG wanted to create a point of gravity, attracting people to come and stay at the square for a while, by counteracting its architectural, social and environmental deterioration. 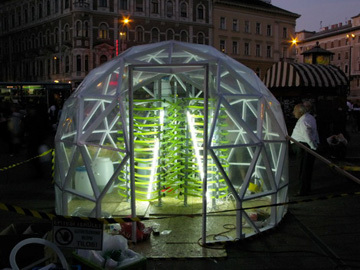 The result, after setting up a cooperation with an expert of the Balaton Limnological Research Institute was Smogreductor: a system circulating unicellular algae in a Buckminster Fuller-type geodesic dome, where outer air was driven through 100 m long tubes, entering the space of the dome cleaner, due to photosynthesis and absorption. Evoking images of mad science but executed with simple techniques as an urban DIY utopia, balancing on the verge of homemade/hi-tech, and scientific/incredible, Smogreductor operated for two weeks; visitors could inhale some healthy air, have a talk with the group, check the machinery and watch an expert interview by SDWG on algae's importance as the greatest producer of oxygen in the ecosystem. Smogreductor made its way to the evening news - right after Obama's Nobel-prize on MTV, the public channel, in an epic length of 108 seconds -, to cultural and green sites, radio-interviews and tabloids, there was even an offer (declined) to re-build it in the studio of a popular morning show, after most of the components were cleaned, dried, neatly repackaged and brought back to the unsuspecting construction stores where they were purchased. But the real success was Smogreductor's ability to detour people, making them stop at Blaha Lujza Square, reshaping the canyons carved into the city by our daily routines.